Today I am pleased to announce the extension of the promotion for my latest books, both of which were published this year. Joshua and Stranger Danger was published on 30th June, 2017 after a two year development period. Giorgie’s Christmas Dinner was published on 1st November with the help of a grant from Arts Queensland and the North Burnett Regional Council’s RADF Committee. I acknowledge their support with gratitude. The most important part for the books now, is to receive reviews from the reading public, for without reviews it is difficult to get any promotion for the books from the online bookstores or Goodreads. which is a site dedicated to the reading public. 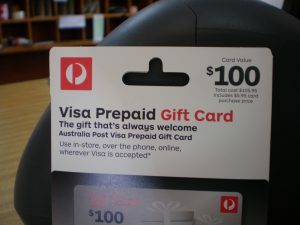 Extension of the $100 gift card giveaway until 15th December. You will receive a total of eight entries with star ratings and written reviews of Giorgies’s Christmas Dinner and Joshua and Stranger Danger on Goodreads. Click on the picture of the book that comes up —go to the green button below the book and click on the arrow to choose ‘read’—hover over the ‘read’ button and it will come up with ‘write a review’ and click on it. Now it will want you to have a logon – don’t logon through Facebook or Google—go to create logon with email and password – when done log off to avoid having to fill in the details on that page. Start all over again – now you can hover over the ‘read’ button to bring up “write a review’ which will bring up the review pane – Click on the stars you want; Write your review. Scroll down, ignoring all the information until you find ‘save’; click the SAVE button and you are done. Putting on the second review will be much simpler as you now have a logon. Click on the picture of the book that comes up —go to the green button below the book and click on the arrow to choose ‘read’—hover over the ‘read’ button and it will come up with ‘write a review’ and click on it which will bring up the review pane – Click on the stars you want; Write your review. Scroll down, ignoring all the information until you find ‘save’; click the SAVE button and you are done. You will receive a total of eight entries for star ratings and written reviews of Giorgies’s Christmas Dinner and Joshua and Stranger Danger on Amazon. Go to www.amazon.com and you will have to logon to be able to place a rating for the books, however this is simple if you do not have one. Just sign up by putting in your email address and adding a password – now you are right to go. They are not going to ask for any other information. Once you have logged onto Amazon, type in the title of either book in the top search and it will automatically bring up the book where you can click on the image to bring up the place where you can post a review, give it a rating, or both! Please private message me on Facebook or by email at joan@joanederrick.com with a link to, or a copy of your reviews. eBook format is available from www.goodreads.com and most of the eBook distributors, including Kindle. Entry is open to all countries where Visa Card is accepted.